You can use the Windows Photo Viewer in Windows 7 to view and organize each of the photos and digital images in your ever-growing image collection. 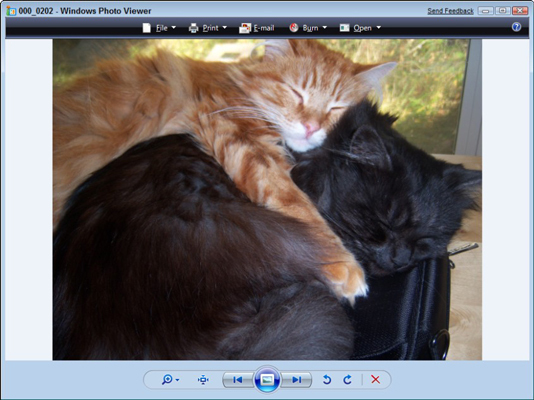 Microsoft moved the Photo Gallery tool from Windows 7 to the Windows Live Essentials download, but you can use the Windows Photo Viewer to do many of the same things. Right-click the Start button and choose Open Windows Explorer. The Windows Photo Viewer window opens. Double-click the Pictures Library icon. Double-click any photo in the Pictures Library folder. If only folders are in this library, double-click one to find a photo. Use the tools at the bottom to navigate through the Pictures. The Next and Previous icons move to a previous or following image in the same folder. The Display Size icon in the shape of a magnifying glass displays a slider you can click and drag to change the size of the image thumbnails. The Delete button deletes the selected image. The Rotate Clockwise and Rotate Counterclockwise icons spin the image 90 degrees at a time. The center Play Slide Show button with a slide image on it displays the images in your Pictures folder in a continuous slide show. If you want to quickly switch to working with a photo in another application, click the Open button at the top of the Windows Photo Viewer window and choose a program, such as Paint or Microsoft Office Picture Manager.